And Yes I see the hand of God......Awesome, just like over you. Nicely done! 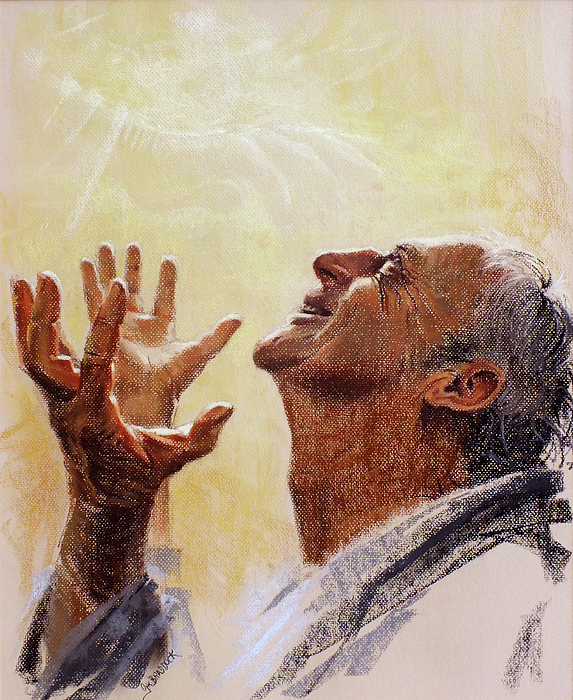 I love how you use light in each of the three pieces to fully convey the mood during despair, prayer, and praise. This painting is one of a set of three that illustrate a question, advice and a promise. The set consists of, Despair. Why are you downcast? Prayer. Hope in God Praise. I will praise Him. See if you can find the invisible hand. 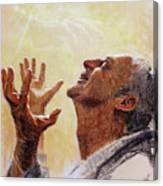 The Psalmist asks himself the question, Why are you cast down Oh my soul? Then he gives himself sound advice, Place your hope in God! 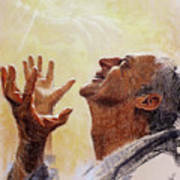 Next he declares his confidence that, I will yet praise him who is my help and my God. A godly old friend graciously took the three poses for me under an oak tree one winter�s day. The original paintings were done in chalk pastel. When hung in sequence, the Despair, Prayer and Praise sequence has spoken deeply to viewers, irrespective of their religious outlook.